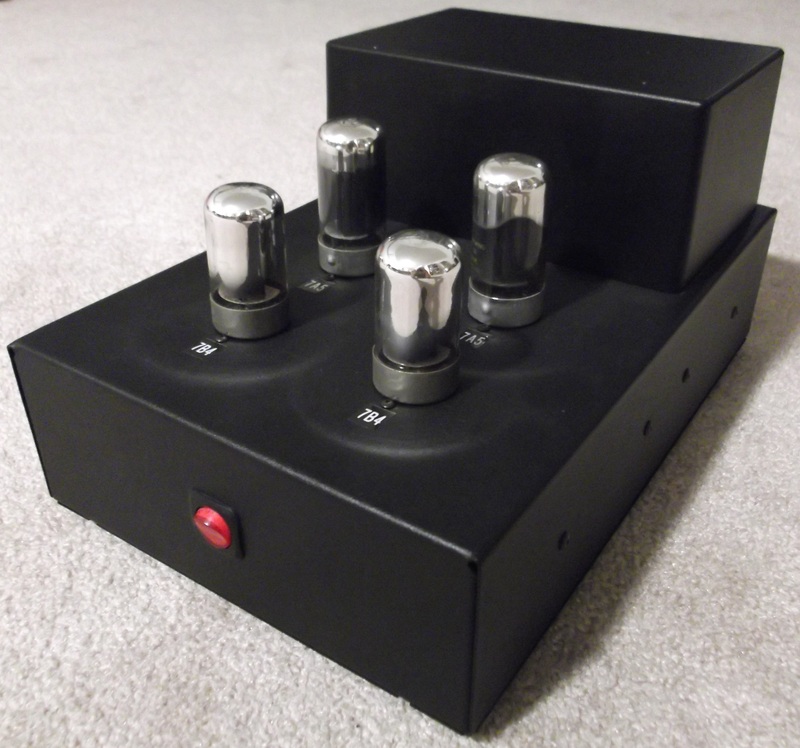 This interesting little amplifier started life intending to be a loktal version of the 6Y6 amplifier already posted. I did not get the results I was hoping for with it, so it was redesigned. Here you see the amplifier built on a Hammond powder coated black chassis. In front are two 7B4 tubes as voltage amplifiers, and behind are two 7A5 tubes as power output. The design will take 7B5 and 7C5 just as well. The transformer cover is actually a pre-painted diecast aluminum box also made by Hammond. Here you see the design of the finished amplifier. The power supply is solid state with heavy filtering to keep hum from the b+ supply. The voltage supply to the 7B4 tubes and the output tube screen grid voltage supply are not stacked, allowing the 7B4 plate voltage to be higher. This gives some improvement in gain and linearity. The output tubes can be any of 7A5, 7B5, or 7C5. All three have the same base pinout. Although the three tubes have different operating characteristics, this circuit will allow their use. The output tube cathode bypass capacitors are not routed to ground, but rather to B+. This is a connection called “ultra-path”, and in theory should help isolate signal AC from the power supply, basically removing the power supply from the signal path. The output transformers were originally radio-grade 5000:8 ohm parts, but were replaced by higher-quality transformers from a vintage reel-to-reel tape deck. Because this is a single-ended pentode design, inverse feedback is unavoidable or the output impedance will be very high. This makes an amplifier sound funny, and that “funny” will vary depending on the speakers used! The feedback here was carefully tuned on my speakers by playing music and turning a potentiometer connected in the loop. The human ear is still the best test instrument for audio! As long as you haven’t played it too loud….